India House on Munidasa Cumaratunga Mawatha (Thurstan Road), Colombo-3 was built in 1926-27 for the Imperial bank of India. Occupied by Agents of the Bank for the first thirty years of its existence, it was purchased by the Government of India in 1956-57. 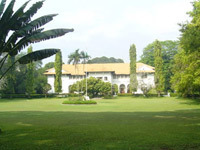 Since then seventeen High Commissioners for India and their families have lived in the house. The work on the building of the house started in 1927, a historic year when Mahatma Gandhi made an impactful trip to Ceylon, seeking contribution for his Khadi Campaign. The magnificent Rain Trees (Samanea Saman) of Thurstan Road set the scale of India House. The house is outwardly symmetrically designed which lends it an appropriate grandeur. A central hip roofed pavilion pedimented on the entrance front and hip roofed on the garden front, wings on either end connected by an open colonnade on the upper floor is superimposed on an arcaded lower storey. An ambiguity of inside and outside prevails throughout the house where what appears to be outside spaces form the periphery of the main internal spaces. The large lounge beyond the entrance hall continues the great height established in the hall , and this runs the entire width of the house and opens onto a terrace sheltered by a cantilevered canopy that is quite daring and unusual for the time. Long cantilevered beams hold up a hip roof which, when viewed from the garden, seems to hover weightlessly above a raised terrace. 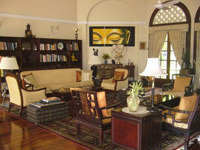 The large lounge with its ample light and fenestration is now furnished as a formal sitting room with both Indian and old colonial furniture. Asian carpets define the different sitting areas on the polished teakwood floors. 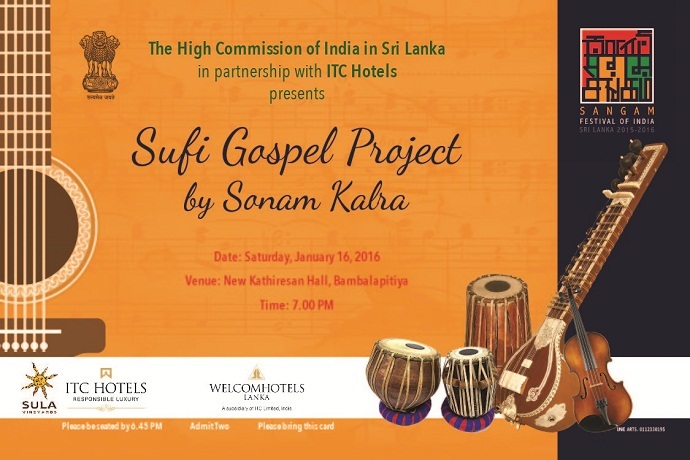 Indeed the house represents the best of Indian traditions in the most graceful of Sri Lankan settings. India House and its gardens have aged with grace. Architecturally, this in no small measure due to the ingenious way in which much of the interior has been made to feel like a simple but grand pleasure pavilion. The simplicity of its conception, like most colonial buildings, has also allowed it to be used in a very different context to which it was originally conceived. Like India itself, the house seems to have taken all its inhabitants in its stride and managed to remain unperturbed as an oasis of clam and tranquility in an increasingly busy urban environment.